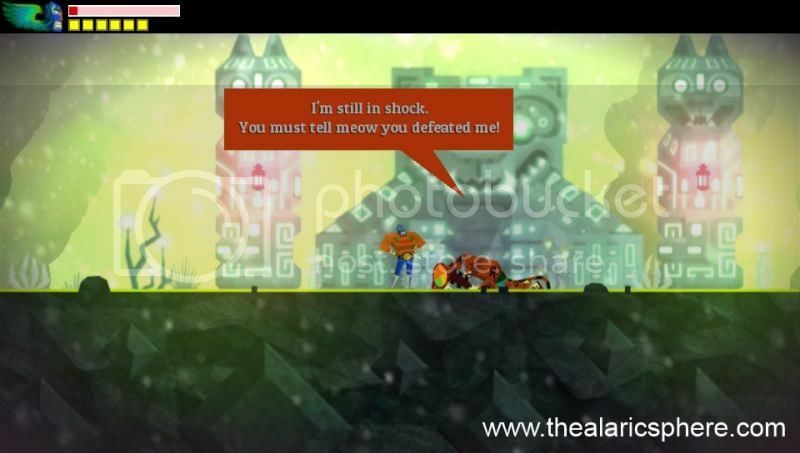 Guacamelee is a platformer for the Playstation 3 and Playstation Vita. It is very reminiscent of the great games from the Super Nintendo era in that it has a lot of elements that made those games fun. Dubbed Metroid-vania since it has the fun exploration mechanics of a Super metroid game and the action from a Castlevania game. Guacamelee is an excellent action and exploration game and most importantly, it’s fun to play. 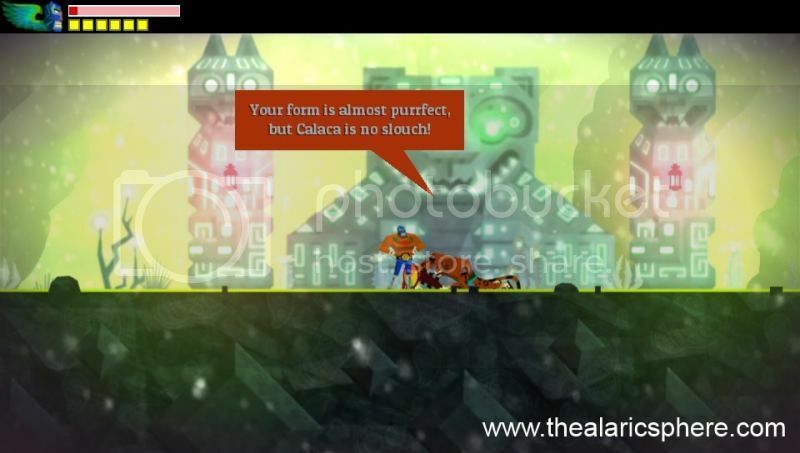 The game puts you in the shoes of Juan Aguacate, who has been murdered, brought back to life by the mysterious luchador mask and hungers for his revenge for the man who killed him and kidnapped his love. 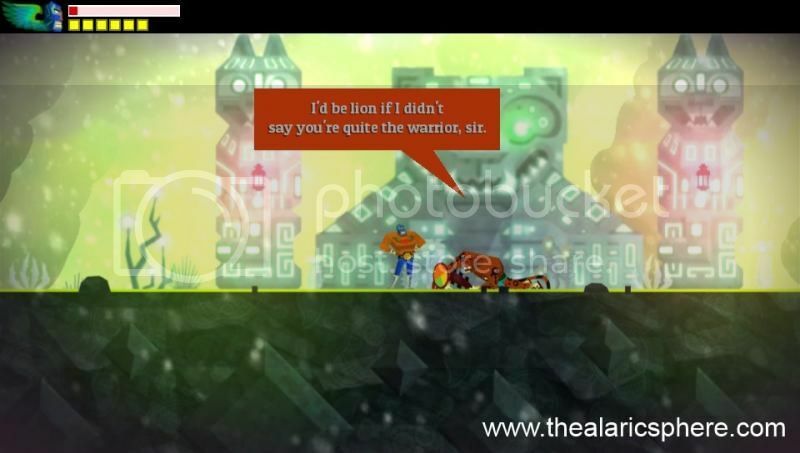 Guacamelee has a sense of humor that shows that it doesn’t take itself too seriously, which is a good thing. This post is not about the game mechanics, it's a metroid-vania game. And it's good. I don't have to talk about how great those games are. Just know that the best parts of those games are all here. 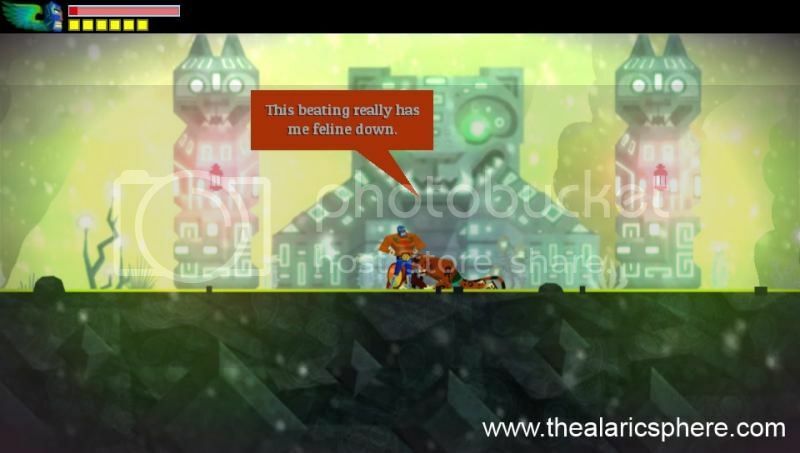 So instead, I’ll show you some funny screencaps that I got after defeating one of the major bosses in Jaguar Javier. He’s supposed to be a cat-like dude so his jokes are all puns of being cats. Get it? 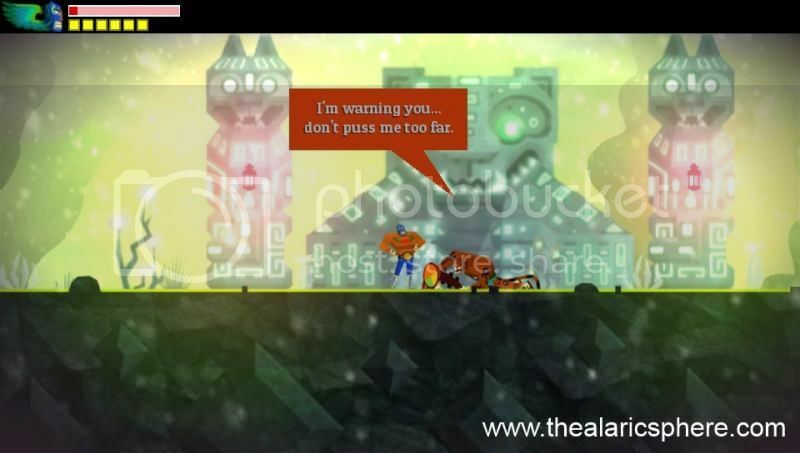 Guacamelee is available on Playstation 3 and Playstation Vita. It’s also a cross buy and cross play title which means you only have to buy it once to play it on both systems, and you can sync your progress online so you can choose which platform you want to play on. There is also a 2 player coop mode where both can play on a PS3 or one on a PS3 and another on a Vita. It is also from Drinkbox Studios, the indie makers of the adorable Mutant Blob Tales from Space. With this they have come up with another hit. 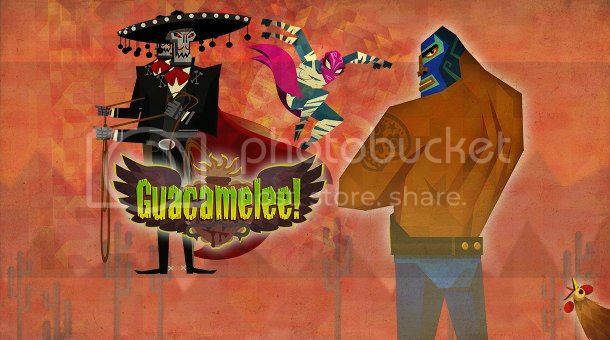 Guacamelee is out for $15 on the Playstation Network.